As your trusted transportation partner, Cincinnati Limousine Service may be a larger expense than flagging down a taxi, until you consider all the benefits. Can a taxi cab or other car services fit up to 28 of your friends and family? Absolutely not! You will be able to pile in with everyone that you love and have the time of your life not just at your big event, but on the way there, between destinations, and on the way home! The fact that you'll have a built-in bar at your fingertips is another major perk! We provide the ice and cups, and you simply bring your favorite mixers, liquors, beer, and wine. You'll save a ton on the exorbitant liquor prices at the bars if you pre-game it a bit on the bus, and you'll have the chance to play bartender for a bit too! Show off your mixology skills and impress your friends. If you've never traveled in vehicles like ours, let us tell you what it feels like to have a professional chauffeur at the wheel. For starters, you will not have to think twice about traffic or parking. You might even enjoy being stuck in traffic, should that happen, because you'll have such exciting amenities at your fingertips, such as HDTVs and a smartphone-capable stereo system. If you and your friends chip in for a Cincinnati Limousine Service Party Bus, you will see that evenly divided between guests our fares end up to be cheaper than theirs, plus factor in the comfort and style that you will get, can you drink your favorite wine inside a taxi? Can you stretch out, stand, dance or even connect your phone or ipod player to a powerful, professional audio system while inside a taxi? These are some of the offered features that cannot be quantified by an amount of money, consider them our free gift to our customers to make sure you have the best time possible. Cincinnati is a city that isn’t short on things to see and do! You won’t find a more diverse group of people in a better spot. 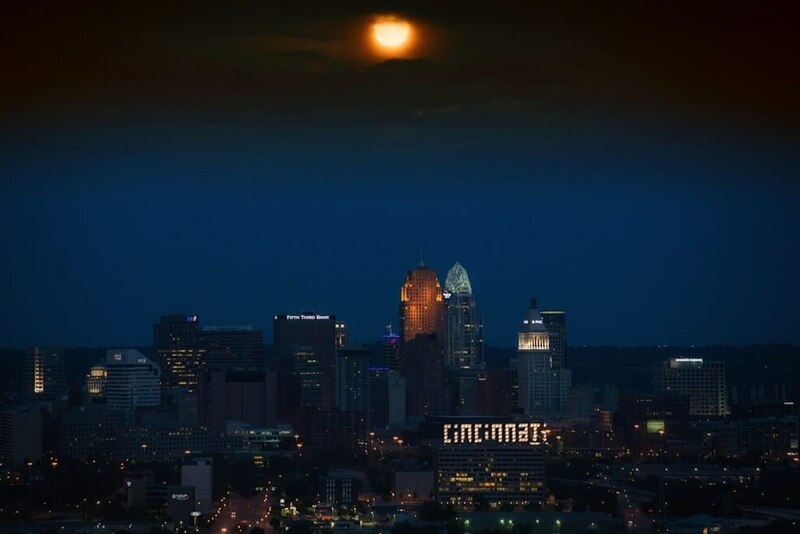 Right next to Kentucky, Cincinnati isn’t just an amazing city; it’s a gateway to another state. With all of the bars and nightclubs to visit, sporting events and concerts, as well as fantastic views, you won’t run out of things to do while you’re visiting. Cincinati Limousine is here to offer a fleet of well maintained and renovated vehicles to provide transportation to wherever you may need to go. Whether you’re following a strict itinerary or you’re open to suggestions for a night out on the town, we’ve got you covered. Our employees are knowledgeable of the area as well as courteous to provide you with the best service possible. Let our booking agents take you through the reservation process quickly and easily, and all you’ll have to worry about is showing up on the big day. We can take care of your transportation needs no matter what you've got planned. Whether it's the biggest day of your life, your once in a lifetime wedding, or perhaps a pre-wedding celebration like a wedding shower, bachelorette party, or bachelor party. We take care of a lot of teen events such as graduations, proms, and school dances. We also take a lot of people to large events like concerts, sporting events, and festivals. If you want to go see the Bengals or the Reds play, there's nothing better than traveling there in one of our luxurious vehicles! You'll feel as glamorous as the sports stars themselves, treated to the utmost in comfort and convenience. Our drivers know all the best routes in our service area and they have GPS systems to help guide them, so you'll always arrive on time. Furthermore, when you do arrive, you'll be dropped off and picked back up right at the door. You can party in between destinations, even drinking while you travel if you've stocked your built-in bar with liquor or beer. We provide the ice and cups. When it's all over, you don't have to worry about the long drive home. You can just relax and enjoy every moment of it. The fact that you don't have to calculate routes, fill up the gas tank, or deal with traffic and parking are definitely major benefits too. There is no easier way to travel than with us. Choosing us for your transportation needs eliminates 100% of the hassle from your drive time and it significantly adds to the quality time that you can spend with your friends. If your destination is an hour away, that's two extra hours round trip where you can chat it up, have some drinks, and enjoy each other's company. If you’re ready to reserve a vehicle or you want or learn more about our vehicles, give us a call or email at any time. We’ll be happy to speak with you. We know that for many of our customers the reservation process isn't well-trod territory and you are likely to have many questions, some of which you may not even be aware you have. Our wonderful staff has plenty of experience and are more than happy to walk you through step by step so we can best accommodate your needs and ensure you and your guests have the best possible experience! Our phone line are open twenty-four hours a day - 7 days a week. We look forward to speaking with you.